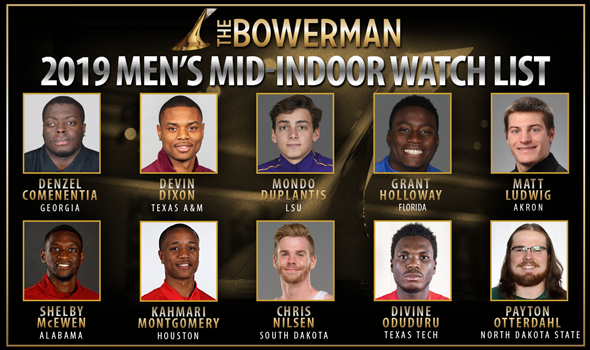 NEW ORLEANS – There continues to be no shortage of great talent amongst the NCAA Track & Field ranks, as is evident by the newest Men’s Watch List for The Bowerman. The first true update of the indoor season, released on Thursday by the U.S. Track & Field and Cross Country Coaches Association (USTFCCCA) saw a record-setting 19 men recognized by The Bowerman Watch List Committee. Only 10 of those 19 men received enough votes to earn their spots on the coveted Watch List, though. Devin Dixon JR Texas A&M Mid-Distance McDonough, Ga.
Mondo Duplantis FR LSU Pole Vault Lafayette, La. Grant Holloway JR Florida Hurdles/Jumps Chesapeake, Va.
Shelby McEwen JR Alabama High Jump Abbeville, Miss. Kahmari Montgomery SR Houston Sprints Plainfield, Ill.
Chris Nilsen JR South Dakota Pole Vault Kansas City, Mo. Payton Otterdahl SR North Dakota State Throws Rosemount, Minn.
Also Receiving Votes: Trey Cunningham (Florida State), Grant Fisher (Stanford), Quincy Hall (South Carolina), Oliver Hoare (Wisconsin), Andrew Hudson (Texas Tech), Morgan McDonald (Wisconsin), Jacory Patterson (Virginia Tech), Anderson Peters (Mississippi State), Harrison Williams (Stanford). Denzel Comenentia has been up to his usual tricks in the early goings of the year. Comenentia is currently ranked second nationally in the weight throw with a heave of 23.52m (77-2) and is fifth nationally in the shot put at 20.13m (66-0½). Devin Dixon made his first Watch List thanks to a record-breaking effort at the Texas Tech Classic back on January 24. Dixon, who is the 11th Aggie male athlete honored in Watch List history, shattered a near 20-year-old American collegiate record in the 800 with his time of 1:45.27 and became the third best performer with the fourth best mark in collegiate history. Mondo Duplantis and Matt Ludwig keep raising the bar, literally. Duplantis and Ludwig tied as the fourth best performers with the fifth best performance in collegiate indoor history with a vault of 5.83m (19-1½) two weeks ago. Then it was this past weekend when Duplantis cleared 5.83m (19-3) at the LSU Invitational to become the second best performer with the fourth best performance in collegiate history. Duplantis is currently ranked first nationally in the event with Ludwig and Chris Nilsen right behind him in second and third, respectively. Grant Holloway has been sensational so far this year. Holloway currently leads the nation in the 60 hurdles and the 60, sits second nationally in the long jump and sixth nationally in the 200. If you’re here for all-time marks, you’ve come to the right place: Holloway has clocked two 7.49s in the 60 hurdles which are tied for the fifth-best mark in collegiate history and then he blistered the track to the tune of 6.51 in the 60, which left him tied as the ninth fastest performer in collegiate history in that event. Shelby McEwen, another first-time honoree, had a breakthrough effort this past weekend at the Carolina Challenge. McEwen soared over a bar of 2.31m (7-7) in the high jump and took over the nation lead by more than one inch. He is just one-quarter of an inch from tying as the ninth best performer in collegiate history and three-quarters of an inch from fourth place. Kahmari Montgomery stood out at the Charlie Thomas Invitational this past weekend. The Houston senior clocked a time of 20.63 in the 200, which left him fourth nationally. He is also ranked 11th nationally in the 400 with a time of 46.28. Divine Oduduru is right in the thick of things when it comes to the short sprints. Oduduru is ranked third nationally in the 200 with his time of 20.58 and sits 14th nationally in the 60 at 6.65. It was around this time last year when Oduduru clocked what was the third fastest 200-meter time in collegiate indoor history. Payton Otterdahl made history at the Mark Colligan Memorial a few weeks ago. Otterdahl, the first athlete from North Dakota State to make the Watch List, became just the third man in collegiate history to launch the shot more than 71 feet indoors. His mark of 21.64m (71-0) stands as the third best effort in collegiate history behind the joint record of 21.73m (71-3½) held by Ryan Crouser and Ryan Whiting. Otterdahl is also the national leader in the weight throw with a heave of 23.68m (77-8¼). Here are those other nine men who received votes from The Bowerman Watch List Committee, but weren’t included on the Watch List: Trey Cunningham (Florida State), Grant Fisher (Stanford), Quincy Hall (South Carolina), Oliver Hoare (Wisconsin), Andrew Hudson (Texas Tech), Morgan McDonald (Wisconsin), Jacory Patterson (Virginia Tech), Anderson Peters (Mississippi State), Harrison Williams (Stanford). The next Watch List will be released on February 28.